This is my last blog post for NCLAC, and I have to say that it doesn't feel as satisfying as I thought it would. Two weeks ago I was involved with the Summer Arts Camp, the same week I started my new job. It was a crazy week, and by the end of it I felt readier than ever for the internship to end. But I don't feel that way now. Now that it has actually happened and I have time to look back on the summer, I find myself a bit depressed. When the summer started, I was afraid it would be like every other summer since I graduated two years ago, filled with many applications and much less luck. But thanks to NCLAC, I was able to occupy my mind with something much less random and much more fulfilling. I remember during the interview telling Ms. Slaughter that my motivation for applying was based on the fact that I was sick of the familiar and I wanted to do something new. This internship delivered everything. If it wasn't for this opportunity, I never would have visited the Farmers' Market and I never would have participated in the Summer Arts Camp, the two weeks of which were the highlight of my summer. I met some great people, too: Ms. Jessica and Ms. Laura, as well as my fellow interns Hillary, Tess and Rosalyn. It was by way of Hillary that I came into my current job. Reflecting on the summer, I realize that I received everything I could have possibly hoped to gain from the internship and now that it's over I can't do anything but feel kind of sad. This has been one of the best and most eventful summers of my life. Thanks for everything, NCLAC, I hope you continue succeeding at the mission and have a good rest of the summer. This week's Art Talk is written by Laura Hunt Miller, NCLAC's Executive Assistant Summer break is underway and parents everywhere are looking for ways to keep their kids occupied. If you have young ones ages 1st through 6th grade who love the arts, NCLAC’s Summer Art Camps are a great way for your children to spend a week this summer! 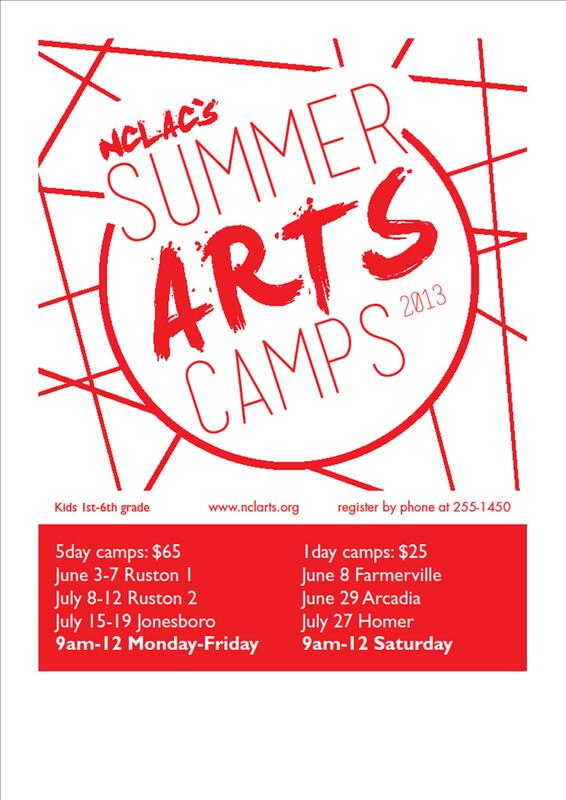 This summer NCLAC has three Summer Arts Camps: Ruston Camp 1, June 23-27; Ruston Camp 2, July 14-18; and Jonesboro Camp, July 7-11. For $65 dollars per child, your children will be supplied a daily snack, and instructed in 2D, 3D, and drama classes from 9 a.m. to 12 p.m., Monday through Friday the week of their camp session. Local full-time drama instructor Beckie Huckaby will teach campers how to “become theatrical characters” during their drama classes, while Ruston Camp 1 and Jonesboro campers will make “accordion books” out of the 2D art projects they create in recent LA Tech MFA graduate Matthew Knopps’ classes. Ruston Camp 2 Instructor Lauren Dixon will teach her students how to create their own beautiful Impressionist “Monet Gardens” with acrylics and watercolor paints. These are just a few of projects in store for SAC campers! On Friday parents, family, and friends are invited to see the projects the kids have completed during their camp week, along with a theatrical performance the children have prepared in their drama classes. This is always a great confidence booster for the campers, and a fun event for the whole family. All campers must be pre-registered for their camp session to assure space and materials are available. To register your young ones call the NCLAC office at (318) 255-1450 during our office hours, Monday through Thursday, 9 a.m. to 3 p.m., or go to our website “Applications & Forms” page at www.nclarts.org/applications/ to download a registration form, and mail it to NCLAC, or drop it off at the Dixie Center for the Arts in Ruston, at 212 N. Vienna Street. We hope to see you and your campers this summer! NCLAC would like to thank all of the Pick Your Picasso sponsors who donated a free week of camp this summer to kids who would have otherwise been unable to take advantage of this great creative summer learning experience. Thank you Ruston Kiwanis Club, John Emory Jr., Elizabeth English, Peter Jones, KLS Physics Group, T.L. James & Company, Hazel Hunter, Julie Roane, Shelly and Edwin Edgerton, Benjamin Denny, Yvette and John Broocks, Tom Boniol and Cathi Cox-Boniol, Jonathan Donehoo, Ruston Sunrise Kiwanis, Brittany Spencer, Carolyn Lewis, Julie Hardie Kaczvinsky, Diane and Dean Dablow, Nancy and John Wallace, Beth Holland, Quota International, and Dorene and Richard Kordal. Art Talk Monday: It's Summer Arts Camp Time! This week's Art Talk Monday is from Jessica Slaughter, NCLAC Executive Director. 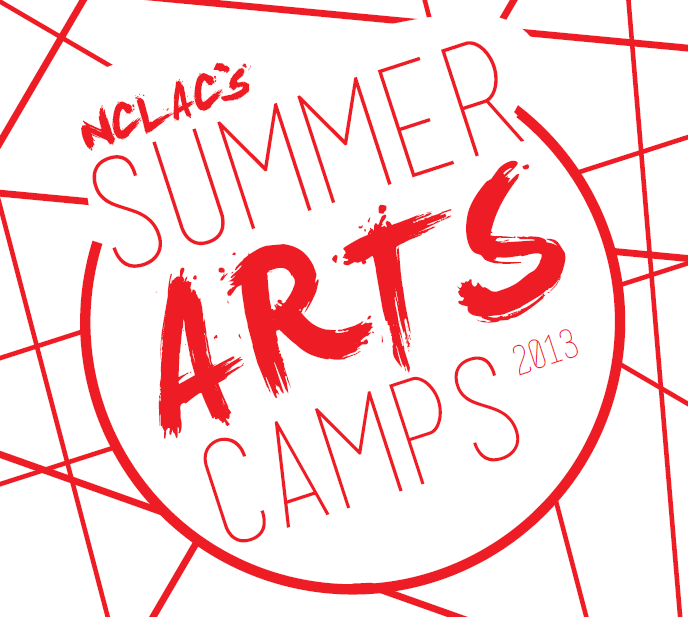 NCLAC is excited for the upcoming summer months, because summer equals art camps! For over twenty years we have been offering art camps in our region, with talented teachers and interesting projects. This year we have three camps scheduled: Ruston 1, June 23-27; Jonesboro, July 7-11; and Ruston 2, July 14-18. Our camps are for students who will be entering 2nd through 7th grades in the fall. Each camp runs Monday through Friday, 9am-noon, and the camp fee includes all supplies and a daily snack. $60 covers tuition if you pay and register by May 1st; $65 is the camp fee after May 1st. 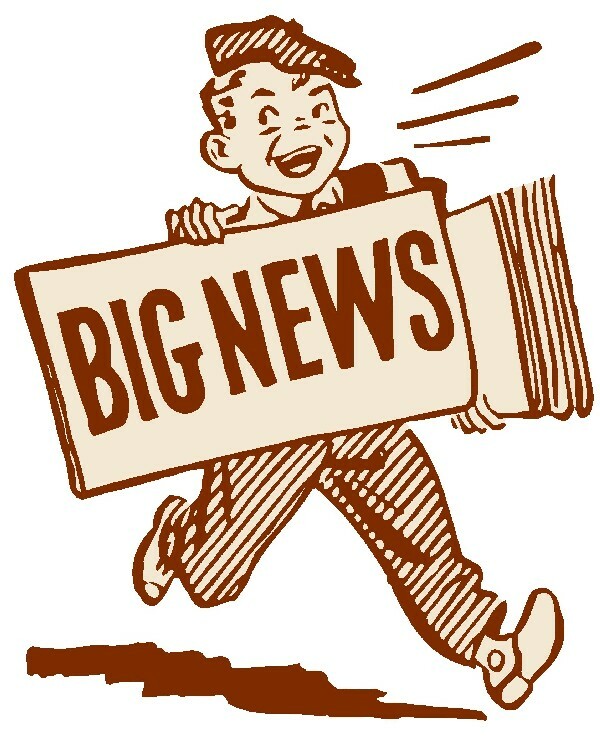 We have wonderful teachers lined up this year, including some who teach in area schools. Lauren Dixon of Dubach School will be teaching at Ruston 2, and Adrian Gibson, from Talented Art in Ouachita Parish, will be teaching at Ruston 1. Artist Matthew Knopps will be back again, as will fiber artist Rachel Johnston. We are excited to welcome Beckie Huckaby of Cedar Creek School, who will be leading our Drama classes. Bethany Raybourn of Farmerville High School will be working as camp coordinator again this year, keeping everyone fed and on track. There are other teachers, assistants, and NCLAC interns who will be working diligently to ensure each camp’s success. This great team will be leading campers in two-dimensional art, three-dimensional art, and drama. Each week when camp ends, we hold a “Final Friday” presentation, where campers display the week’s artwork and hold a short performance they’ve prepared in drama. Friends and family are invited, and it’s a perfect way to end a week full of creativity. We are very appreciative of the support we receive from our local partners who provide space for our camps. First Baptist Church of Ruston is offering classrooms for the Ruston camps again this year, as is United Methodist in Jonesboro. We work hard to keep our camps affordable for children, and the donation of classroom space is a huge asset in this goal. One of my favorite things when organizing these camps is rounding up our volunteer assistants. Each year we have parents call and say, “My child has aged out of camp but has loved going for so many years. Can he/she assist?” For me, this is the mark of a successful program: parents trust us to care for and inspire their children, send them to us year after year, and then when they get older, the teens want to come back and volunteer to continue the art camp tradition. It’s a lovely cycle. So, if your children or grandchildren attend NCLAC Summer Arts Camps each year, now is the time to register! And if your kids have never attended a NCLAC Summer Arts Camp, this is a great year to begin! You may download a registration form here from our site, nclarts.org, or call our office at the Dixie Center for the Arts, (318)255-1450. It's Time to Pick Your Picasso! 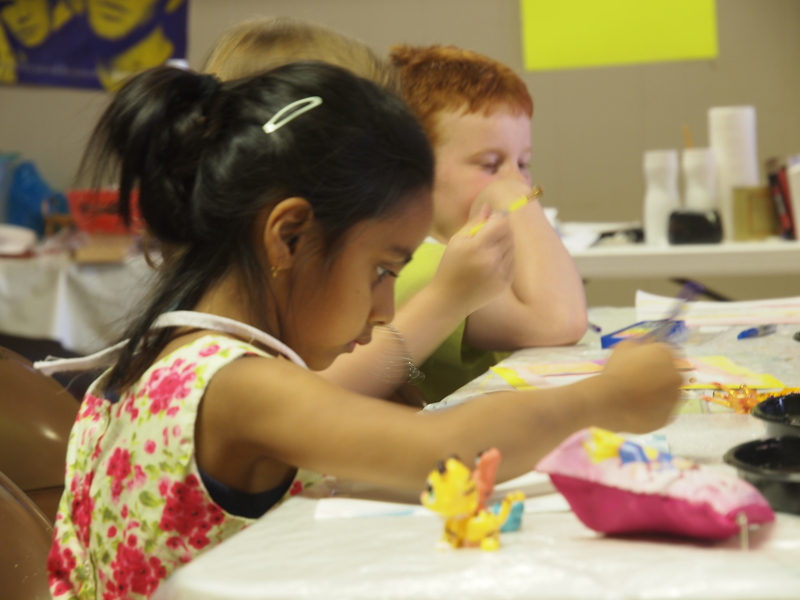 Each summer we holds a series of art camps that offer two-dimensional, three-dimensional, and theatrical art classes. These classes expand children’s capacity for learning and self-expression as they explore their imaginations and boost their self-confidence through the creation of their own artworks and dramatic performances. Although NCLAC makes every effort to keep our camps affordable, there are still children in our area that are unable to attend due to financial constraints. This is why five years ago we founded the Pick Your Picasso campaign. So far we have sent 100 kids to camp for free, and this year we hope to be able to sponsor another 20 children. A $60 donation sponsors one child for a week of camp, including art supplies, daily snacks, and a free Summer Arts Camp T-shirt. Any additional funds we raise through the campaign go to support our other arts educational programming, such My Vision My Voice, a six-week program that combines journalism with photography, in order to teach pre-teens and teens to tell their stories, utilizing their own voices and points of view. These programs are also free for participating students. We honor our Pick Your Picasso donors in a printed “Thank You” article in the Ruston Daily Leader, and publish donor names on our Summer Arts Camp webpage on our website. Donors who give before April 11th, 2014 are also listed on our 2014 Summer Arts Camp t-shirts. We are nearing time to send the scholarship award letters to prospective students, so please send your Picasso donation no later than April 18. We must ensure the number of scholarships before awarding them to students. It is amazing to watch how much these one-week sessions affect the lives of the children who attend them. We hope that you will consider giving a child the gift of creativity, self-confidence, and the new friendships they will gain at Summer Arts Camp this year! You may print and mail the Pick Your Picasso form (found below) to NCLAC PYP, Po Box 911, Ruston, LA 71273, or drop it off at the Dixie Center for the Arts, 212 North Vienna, Ruston. You may also donate online via paypal through our website. This week's Art Talk Monday is written by Jessica Slaughter, NCLAC Executive Director. Much to the delight of students and teachers, the summer break is now upon us. Hot weather and whines of “I’m bored” will undoubtedly be here before long, so take a moment today to register your child for NCLAC’s Summer Arts Camps. We still have spaces available at each of our camps, both five-day and one-day, but the five-day camps are almost full. Pre-registration is a requirement, as we have to adequately prepare supplies and snacks for our campers. The traditional five-day camps this year will be held in Ruston on July 3-7, and July 8-12, and in Jonesboro July 15-19. Students who are entering 2nd-7th grades are eligible to attend. They’ll have classes in two-dimensional art, such as drawing and printmaking; three-dimensional art, such as fiber arts and sculpture; and drama, such as improv and playwriting. These camps are $65, which includes all supplies and snacks. The one-day camps will be held in Farmerville June 8; Arcadia June 29; and Homer July 27. At these Super Saturday camps, students will have extended sessions in Visual Art, with projects ranging from weaving to bas relief, and Drama, with theatre basics. These camps are $20 if you register 10 days before the camp, $25 after that date. The fee includes supplies and a snack. The camps are funded in part through a grant from Entergy, who is committed to improving the quality of life in their coverage region. For years the company has granted funds to assist with the cost of our art camp supplies, keeping the camp costs manageable for families. In addition, our Pick Your Picasso donors have generously given scholarship monies so that a number of talented students throughout the region can attend the NCLAC art camp in their parish of residence. Writing the scholarship award letters is such a wonderful part of my job each spring, and it couldn’t happen without our Picasso donors. So, don’t delay in registering your camper; come join the fun with our summer arts programming! You may register online via our site, nclarts.org; by calling our office at (318)255-1450; or in our office inside the Dixie Center for the Arts, Monday-Thursday 9am-3. In other NCLAC news, it is time for annual Keep the Arts Afloat fundraiser. This event truly keeps NCLAC going throughout the year, providing operational support so that we can continue our work in the region. The fundraiser works like this: we accept 250 donations of $100, and then we draw one lucky donor who receives $5000. The odds of your name being drawn are very good, and each donation makes an incredible impact on our organization. If you’re a regular “Art Talk” reader, then you’re familiar with the work we do in the five parishes of Lincoln, Bienville, Claiborne, Jackson and Union. If not, then let me list a few of the ways in which we serve our area: Summer Arts Camps, Peach Art Exhibit, Holiday Arts Tour, Drama Warehouse, My Vision My Voice, art exhibitions, educational performances, and special demonstrations/lectures at area schools and libraries. We often work as art facilitators for other organizations in the area, and we have strong partnerships with many nonprofits in our region. All this is to say, our nonprofit work is made possible through donations, and the Keep the Arts Afloat fundraiser is the perfect time to make that donation. The drawing is held on Father’s Day, June 16, at the Peach Festival Art Exhibit reception. Call our office or contact any NCLAC board member to make your donation. We extend a heartfelt thank you to those of you who continue to support us through the years. Good evening, arts supporters! This is our final "Teacher Feature" installment, honoring our final instructor for NCLAC's upcoming Summer Arts Camps. Without further ado, allow me to introduce you to one of our SAC instructors: Adrian Gipson. Summer Arts Camp is almost here! We have one month until the first camp in Ruston. We are preparing as much as we can to make sure the kids have a great experience and you could be a part of that. Before I tell you how you can help a kid have the best time that they can, let me tell you what makes their time so special. Have you ever had the opportunity to create something out of nothing? Maybe it's trying a new recipe. Or working on a flower bed in your yard. Or maybe even starting up your own business. Do you remember the rush you got when you first began? The struggle to give up when it got difficult? And the elation and pride you felt when you put away your tools and were able to look at what you've completed? The students get that same opportunity with Summer Arts Camp. They get to branch out and try things that many of them probably haven't done before, including 2D art (painting, drawing, etc), 3D art (sculpture), and even drama. They have the chance to create something from nothing. To feel that pride of accomplishing something. A special item we will need this year is shoeboxes (lids not necessary). We are also taking donations for Mardi Gras beads for a community mosaic project. Art Talk Monday: Summer Arts Camps Almost Here! Art Talk Monday this week is written by Jennifer Downs, NCLAC technical writing intern and LA Tech graduate student. In just a few short weeks, schools across north Louisiana will be letting out for summer vacation. If you are looking for a way to nurture your child’s creativity and keep him/her occupied, check out the North Central Louisiana Arts Council’s upcoming Summer Arts Camps! NCLAC’s camps offer a great opportunity for students entering grades 2 – 7 to engage their imagination with 2-D, 3-D, and performing arts classes taught by talented local artists and MFA students from Louisiana Tech University. NCLAC is offering camps throughout our five-parish area of Lincoln, Bienville, Claiborne, Jackson and Union. In Ruston, there will be two week-long camps. Each camp will have different projects, so we encourage you to attend both! RUSTON 1 (June 3-7) will be at the First Baptist Church, 200 S. Trenton St., and will be taught by Carolyn Smith, Peter Hay, and Matthew Knopps. RUSTON 2 (July 8-12) will also be at First Baptist Church and will be taught by MC Davis, Carolyn Smith, and Adrian Gipson. JONESBORO (July 15-19) will be held at United Methodist Church, 402 4th St., and will be taught by Peter Hay, Rachel Johnston and Carolyn Smith. We also offer three Super Saturday camps! The FARMERVILLE camp (June 8) will be held at the First Assembly of God, 900 S. Main St., and will be taught by Carolyn Smith and MC Davis. The ARCADIA camp (June 29) will be at First UMC, 2122 Myrtle St., and will be taught by Carolyn Smith and Emma Case. The HOMER camp (July 27) will be at Homer City Hall, 400 E. Main St., and will be taught by Mary Dunn. Tuition is $65 for the week-long camps and $20 for Super Saturday camps if you register and pay at least ten days before the camp (or $25 afterwards). Tuition covers all supplies and a daily snack. All camps start at 9am and last until 12pm. 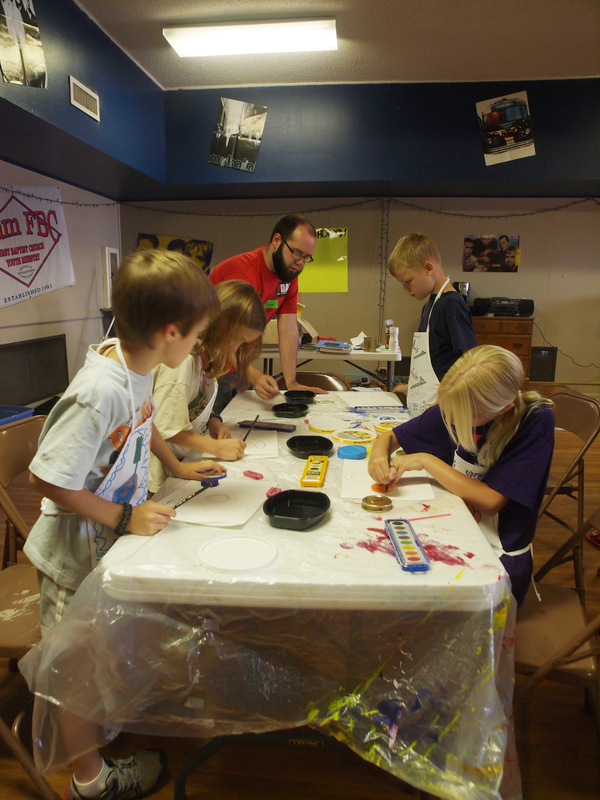 We are incredibly grateful to our partners throughout the region who donate spaces for our art camps. NCLAC partners with the following organizations: First Baptist Church in Ruston, United Methodist Church in Jonesboro, First Assembly of God in Farmerville, First United Methodist Church in Arcadia, and Homer City Hall and the Claiborne Jubilee in Homer. In addition, a grant from Entergy assists with the cost of supplies for the camps. This support is essential in keeping the costs of our camps reasonable for families year after year. Take advantage of this wonderful opportunity to spark your student’s imagination with exiting 2-D, 3-D, and performing arts activities! See you at camp! It’s starting to feel like summer! In just a few short weeks, schools across north Louisiana will be letting out. If you are looking for a way to nurture your child’s creativity and keep him/her occupied, NCLAC’s Summer Arts Camps (for students entering 2nd – 7th grades) are will start in June. This week, I want to introduce you to another one of the talented artists who will be instructing one of the camps: Mary Booth Dunn! This week, the star of our Teacher Feature is Mary Catherine Davis! She has participated and volunteered in many community arts exhibitions, events, and workshops. NCLAC is happy to have her as an instructor for Summer Arts Camps 2013! She will lend her talents to a workshop, teaching 2D visual arts. When someone mentions the name "Homer," I get two images in my head: a yellow cartoon character and a philosopher/poet/marble bust. Fortunately, the town of Homer was named after the latter. Homer, LA is the parish seat of Claiborne Parish. The town was laid out around the brick courthouse which is one of only four pre-Civil War courthouses in Louisiana that is still in use. It was completed in 1860. The building is built in the Greek Revival style of architecture which speaks more to the Anglo-Saxon influence on the area than the French influence. Two of the biggest industries in the history of Homer and Claiborne Parish have been cotton and oil. During the Civil War, some area farmers would trade cotton with Union Soldiers in Monroe, LA, even though Claiborne Parish was strongly Confederate. The Herbert S. Ford Memorial Museum claims to have the oldest bale of compressed cotton in existence. It is said to have been baled around 1930. In 1921, oil was discovered in Homer and people's lives were forever changed. The same museum holds a "Black Gold" exhibit featuring a recording of how a farming family moved from Mississippi to take advantage of the boom. The oil boom led to the building of Hotel Claiborne, which was established in 1890 and declared a state historic site in 1984. Spring is here, although it sort of feels a bit like summer already, and our office is in full swing for educational and community activities.We have many events coming up for which we need volunteers, and everyone knows volunteering does a body good. Take a look at our list and pick something you love, or something you'd like to learn more about! This is a community-wide mosaic project, that will ultimately be turned into a calendar that will benefit area nonprofits and schools. June 13 at the Ruston Civic Center. Come meet someone new; two volunteers will work each shift. June 14 at the Ruston Civic Center. Bring a friend for this gig; four two-person teams are needed. 9am until completed, which is usually around noon. June 16 at the Ruston Civic Center. Like to cook? You can help us with tasty refreshments for our community reception! Give us a call at 255-1450, or an email at nclac5@gmail.com, and we'll sign you up! Another week, another Teacher Feature -- we are counting down to Summer Arts Camps! 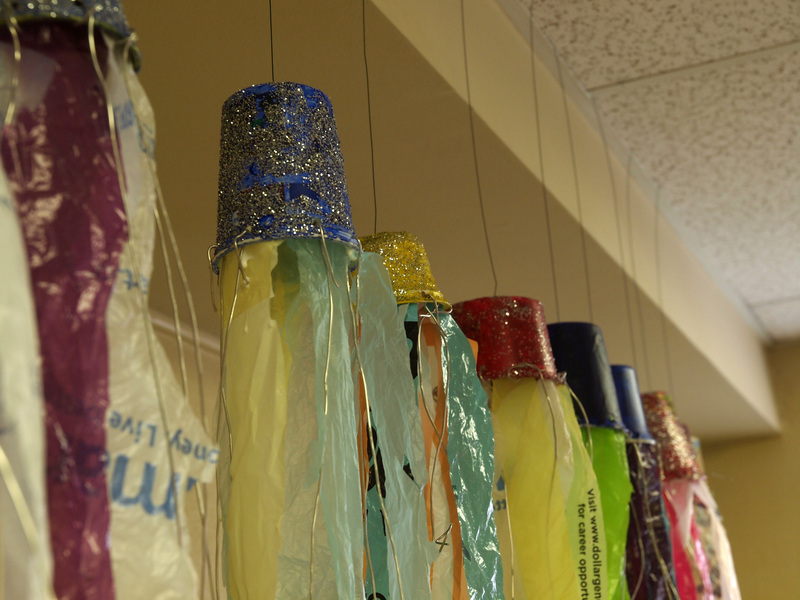 NCLAC has selected the best and brightest arts instructors in our area to lead these camps. This week, I want to introduce you to Rachel Johnson, a self-taught fiber artist who uses natural materials in her work to achieve an earthy, rustic quality. Her artistic skills include fiber arts, leather work, and soap-making. Little know fact: Arcadia is the highest elevated town in all of Louisiana. Arcadia is the parish seat of Bienville Parish and home of the monthly Bonnie and Clyde Trade days, an event I've always loved going to since I was a youngster. Arcadia is named after the French Colony in Nova Scotia and the name means "beautiful hills." The city has a rich history of outlaws, political uprising, and cotton. Bienville Parish's economy heavily depended on cotton before the Civil War. Farmers never quite lived the genteel plantation culture that we imagine was the norm for cotton farmers, but they were able to live well. Then came the Civil War. Slavery was finally abolished in the South. Costs of cotton production rose and demand dropped dramatically. King Cotton was taken off of his throne. Sparta was the first parish seat of Bienville Parish, and in 1890, Arcadia and Gibsland petitioned the state to hold an election to change the parish seat. In the third referendum, Arcadia won the vote by 65 and beat out the other candidate towns. However, there is still controversy surrounding that election. The story goes that half an hour after the ballots were tabulated, six wagons loaded with Arcadians surrounded the empty courthouse. Some of them went into the courthouse and began tossing the records to their waiting companions. There was a wild chase that night in 1893, and some of the records were undoubtedly lost. Many newspapers referred to that night as the night the "Bienville government was stolen." Now these guys were small time compared to the most infamous duo to ever grace the pages of Arcadia newspapers. Enter Bonnie and Clyde. There could be several posts written about these two, so I'll keep it short. Bonnie Parker and Clyde Barrow were notorious outlaws responsible for killing 9 police officers and several civilians throughout the central US. They were gunned down on May 23, 1934 in Bienville Parish and their bodies were brought to the Arcadia coroner's office for examination. Today, Arcadia holds the monthly Bonnie and Clyde Trade Days, a huge weekend long flea market that takes place on the weekend before the third Monday of the month. I hope you are enjoying the warm weather outside! As we get closer to the end of the school year, keep in mind that NCLAC's Summer Arts Camps are a great way to help keep your child occupied while also enriching his or her creative and artistic development. As part of our weekly “Teacher Feature,” I want to introduce you to another camp instructor: artist Peter Hay! Peter was born in Maryland, moved to Ohio, and then settled for a while in Oklahoma. 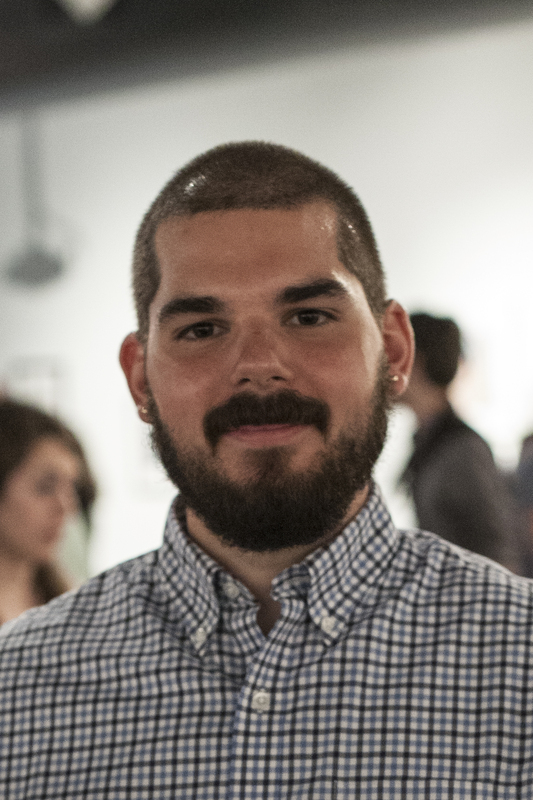 He received his Associate of Art degree from Northern Oklahoma college before earning his Bachelor of Arts at Northeaster State University in Tahlequah, OK. Peter is currently a graduate assistant at Louisiana Tech University, working on this MFA in studio art. Peter's surreal and still life paintings were featured during Holiday Arts Tour 2012 at the Dixie Center for the Arts. Peter will teaching 2D (drawing and painting) at a weeklong camp in Jonesboro, from July 15-19. Registration for weeklong camps is $60 if you pay before May 1 ($65 after that date). We also have several “Super Saturday” that are just $20 if you register and pay 10 days before the camp ($25 after that date). Camp fees include a snack. Students entering grades 2-7 are eligible to participate. Farmerville has a surprising lack of farmers. Well, farmers in the agricultural sense. The misleading name actually came from one of the founders of the town. The first man to buy a lease of land in what is now Union Parish was John Honeycutt. John was a trapper, so the area was perfect for him. John got his lease from the Spanish government way back in 1790, and he settled in. A few years roll by with John scratching out a living doing his trapping thing when a roving band of Native Americans came through. They told John that there was another family that had settled in the area. When John went to meet the new neighbors, he was pleasantly surprised to find a settler named Feazel living with what could only be described as a house full of girls. The story says that John eventually asked Feazel for the hand of one of the girls. Typical guy. People came from all over the South to settle in the area, and Union Parish was carved out of northern Ouachita Parish in 1839. Naming the parish seat proved to be a difficult matter. Matthew Wood donated the land for the town, but didn't want the town to be called Woodville. (Maybe he thought the name would be too mainstream.) The name was decidedly named after the Farmer family. On May 17 of that year, the first Union Parish police jury made the ordinance to officially name the town Farmerville. It wasn't until 1842 that the town received a charter and was incorporated. There isn't much trapping going on in Farmerville anymore, but the outdoors still plays a huge role in the area. Lake D'Arbonne is an artificial lake which started with a $1 000 000 appropration in 1957 and was completed in 1963 with a cost of about $3 000 000 (just over $22.7 million in today's dollar). The lake covers 15 280 acres with 100 miles of shoreline and is 15 miles long. It's fed mainly by Little Corney Bayou and Corney Bayou, but Bayou D’Arbonne, Middle Fork Bayou, and Little Bayou D’Arbonne are also contributing sources. Lake D'Arbonne boasts plenty of fishing and water sports along with camping at the state park. A long history that revolves around the outdoors and the new lake can lend itself to a great future for the area. I had the opportunity to talk with Katie Knight, local country music artist and Farmerville native. Katie said that she loves her home town. "It's a small town with a small town feel. Everybody knows everybody." I asked Katie about how growing up in Farmerville has helped her songwriting. She says it gives her a perspective to work with. She knows what it's like to live in such a small town and imagines what it would be like to live in a big city. To learn more about Katie Knight and her music check out her website. Farmerville is hosting one of NCLAC's very special Super Saturday Arts Camp on Saturday, June 15. At this exciting one day camp, your kids will participate in visual and performing arts. The camp will take place at the First Assembly of God on 900 S Main St. Registration for this even is only $20 by June 5 and $25 after June 5. This includes supplies and a snack. Camp is from 9am - noon. 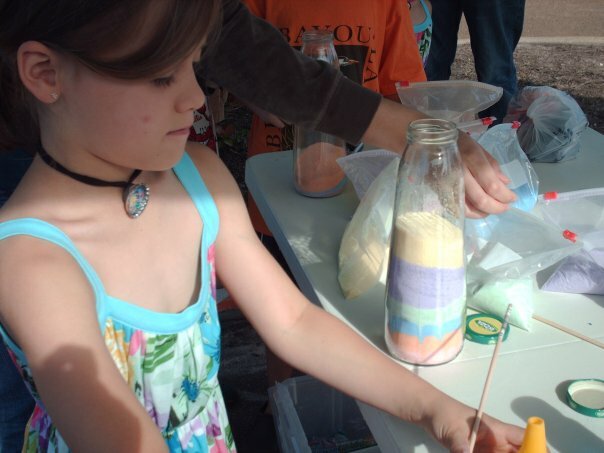 If you've got a youngster that's currently in 1-6 grade and you think they would enjoy a day full of fun arts based activities, click here to download the registration form. You could also call the NCLAC office at 255.1450 to register. Good afternoon, everyone! I hope you are having a wonderful Tuesday. It is time for another installment of “Teacher Feature,” when we highlight one of the amazing individuals who will be helping NCLAC with Summer Arts Camps. Today, I am happy to introduce you to Bethany Raybourn, our coordinator for the two Ruston camps this year. Bethany has been involved with NCLAC for quite some time now, demonstrating her commitment to arts education. Last year, Bethany was one of the volunteers who helped with SAC 2012. We are excited to have her with us for SAC 2013! Here’s a little background about Bethany: she was born and raised in North Louisiana. She obtained her BA in English from Louisiana Tech University, and this May she will graduate with a Master of Arts in Teaching (Secondary English Education). Bethany spends most of her time as a high school English teacher, which is a profession that she says she has grown to love and enjoy over the past year. In her spare time, she loves to write poetry, turn her poems into songs, and then perform them. She says that she developed a love for music, songwriting, and the arts in general at a very young age, and she is always excited to take part in any opportunity to participate in or volunteer for NCLAC events. Are you interested in signing your child up for a Summer Arts Camp? Students entering grades 2-7 are eligible to participate in Summer Arts Camps! This year, we will have both weeklong camps and several “Super Saturday” camps. Weeklong camps are $60 if you register and pay by May 1; $65 after May 1. Camp fee includes supplies and a snack. Super Saturday camps are $20 if you register and pay 10 days before the camp; $25 after that date. Camp fee includes supplies and a snack. For twenty-five years, the North Central Louisiana Arts Council (NCLAC) has been serving the region by providing arts opportunities in Bienville, Claiborne, Jackson, Lincoln and Union Parishes. One of our longest-running programs is Summer Arts Camps, known as Summer Arts Chautauqua when it began twenty years ago. Summer Arts Camps are interactive, multidisciplinary art adventures for students who have completed 1st through 6th grades. Campers explore visual art as well as drama, and are taught by artists from around the region. The camps are special community events, with space for classes donated by local groups to which we are extremely grateful. This year we are adding a twist to the program, by offering three five day camps, and three “Super Saturday” camps. The five day camps this year will be from 9am-noon, Monday through Friday, with classes in 2D, such as drawing and painting; 3D, such as fiber and clay; and drama, such as movement, playwriting, and improv. Jonesboro, July 15-19, United Methodist Church, 402 Fourth St. The camps are loads of fun, and students come back year after year, often volunteering as teachers’ assistants when they’ve “aged out” as campers. Tuition for each five day camp is $60 if you register and pay by May 1. After this date registration is $65. Payment upon registration is necessary in order for us to adequately order supplies. Now on to the Super Saturday camps! These one day art camps will be held from 9am-noon, and will have classes in visual art (experimenting with 2D and 3D forms) as well as drama. Tuition for these camps is $20 if you register and pay ten days before the camp; $25 registration after that date. Arcadia, June 29, First United Methodist Church, 2122 Myrtle St.
For all of the camps, supplies and a snack are included with your student’s tuition, and each camp ends with a final performance and exhibition of work. Students always enjoy performing for their parents, and parents enjoy seeing what their children have been learning and creating. Another special part of NCLAC’s Summer Arts Camps is our scholarship program, Pick Your Picasso. This effort raises tuition for 25 students in NCLAC’s five parish region. Supporters in our area make donations to cover the tuition of students who have talent and interest in the arts, but are unable to pay for camp. Conversations with school counselors help our office compile the list of Picasso students, and then when monies are received, the scholarship students are invited to attend to the camp in their parish for free. If you are interested in registering for a camp, or in becoming a Pick Your Picasso donor, please visit our website at nclarts.org, or call our office at 255-1450. Summer is just around the corner! Camps fill up quickly, so take care of your registration today.